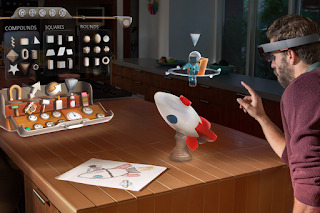 Ever since Microsoft showed off a prototype of its augmented reality HoloLens glasses earlier this year, the tech world has been abuzz. The glasses use holographic technology and Microsoft's Windows 10 software to overlay digital images onto the wearer's view of the real world. A user can stare at their living room wall and see digital objects, from video games to video conferencing. More importantly, the user can interact with the digital objects. An early version of HoloLens will be available to developers in 2016 for $3,000. Consumers may have to wait until 2017.